At the Center for Bionic Medicine, much of our research is focused on improving the quality of life for people with limb loss and other physical disabilities. On occasion with this blog, we will profile inspiring individuals who are affiliated with either our lab or the hospital. In this story, Paralympian Josh Misiewicz, who plays for the AbilityLab Blackhawks, describes his journey to the 2018 PyeongChang Paralympic Winter Games. While on military duty in Afghanistan in July 2011, a blast from an IED severed both of LCpl. Josh Misiewicz’s legs above the knee. In the beginning stages of his recovery, everything about his hospital stay felt strange. Recovery meant learning how to use two prosthetic legs – at first he could only walk 5 minutes with them – but also finding activities he could practice outside of therapy. Almost immediately, he gravitated toward the ice rink to play sled hockey, a modified form of ice hockey that involves sitting and skating on a sled while trying to score with the puck. A student athlete who played hockey in both high school and at St. Mary’s University of Minnesota, Misiewicz felt at ease amid the frigid air and familiar whir of metal grazing the ice. Not long after beginning his therapy, he joined the USA Warriors Ice Hockey Program, a military sports group for injured veterans, where his teammates pushed him to work harder both on and off the ice. After returning home to the Chicago area, Misiewicz continued playing sled hockey and joined the AbilityLab Blackhawks. Last July, he qualified for the 2018 PyeongChang Paralympic Winter Games, his first time at the competition. For months, he lived with his teammates to focus solely on training, spending their days in the ice rink or weightlifting room. Their hard work paid off. This past March, the team took home gold, beating out rivals Canada in overtime in the final game. Photo credit: Danny Chin/Wheelchair Sports Federation. Misiewicz, who is 29, plays the position of center. He says that while sled (sometimes also called “sledge”) hockey is similar to the hockey he played in high school and college, there are some notable differences and challenges. Players must balance on a modified metal sled frame that has two skate blades underneath it, for example, and continue to achieve this balance throughout the entire game. Players must also learn to shoot and skate using their arms and hips. 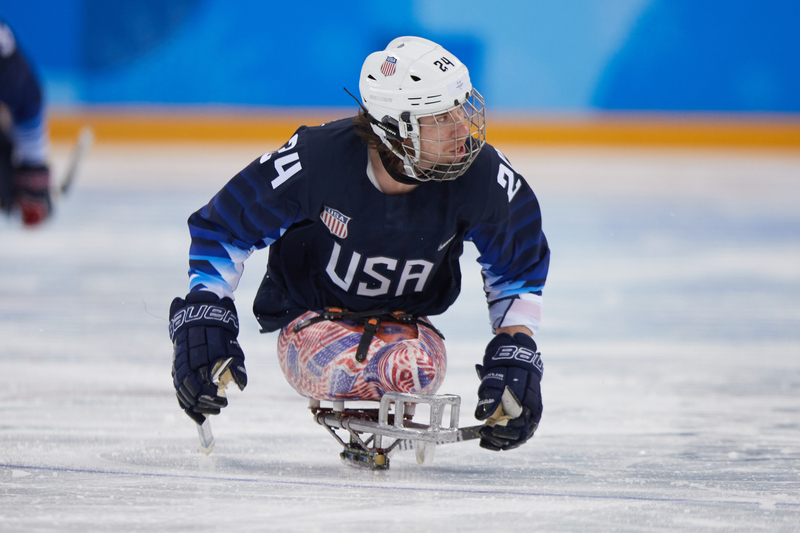 Although he’s uncertain if he will have the chance to participate in another Paralympic Games, sled hockey will continue to be an important part of his recovery. It's also an activity he’ll remember as something that taught him that life after limb loss can be full of different opportunities to discover.